Acer has announced the arrival of the neoTouch P300 and P400 smartphones, both of which are packing Windows Mobile 6.5.3. First up is the P300. This smartphone is touted to being 'stylish' with the ability to combine both your personal and business life in one handset. While any business/personal combination usually spells trouble (especially after 15 eggnogs at the work Christmas party), Acer assures us that the P300 has a strong emphasis on 'efficiency, reliability and security'. Cutting through the bumf, this means that there is Flash and WindowsMedia Player 10 support for those who want to have a little downtime and Mail, Microsoft Exchange Server Support and Microsoft Office Mobile applications for those who really, really need to read that email. A Qualcomm 7227 processor running at 600 MHz is inside the device and web search comes in the form of Bing. For those who aren't that pleased with touchscreen QWERTY, you'll be pleases to know that the device has real QWERTY keyboard for you to type out all of your missives on. Screen-wise, the neoTouch P300 has a 3.2" high-definition (HVGA) touchscreen and there's a 3.2-inch camera on board for those who want to take images. Couple this with a micro-SD hub, Wi-Fi, 3G and Bluetooth connectivity as well as a 3.5mm headphone jack and the P300 seems to tick most boxes. The P400 is not only 'stylish' like its P300 bed-fellow but also 'smooth', according to Acer. Also equipped with Windows Mobile 6.5.3, the P400 is endowed with Mail, MicrosoftExchange Server Support and Microsoft Office Mobile applications. Again the Qualcomm 7227 processor running at 600 MHz is on board as is Bing and Internet 6 mobile. 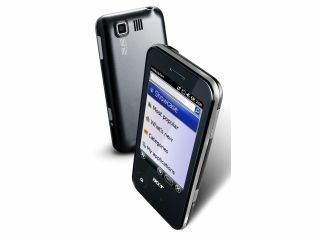 In fact, most of the specs are exactly the same as the P300, except that the P400 has a lack of a real QWERTY keyboard. Both the neoTouch P300 and neoTouch P400 have a UK release date of May, with pricing to be announced. Interestingly, if you are looking for the handset in the US or France it will be called newTouch and not neoTouch.